Eleven points to spare at Celtic Park, Big Sean led the charge and Tyrone eased through to the Ulster semi-final. We hear from the big Moy man,Manager Mickey Harte and Derrys deflated Damien Barton. The Tyrone minor footballers and senior hurlers recorded excellent wins at the weekend while there was another full round of games in the all County league, We hear from some of the management teams. 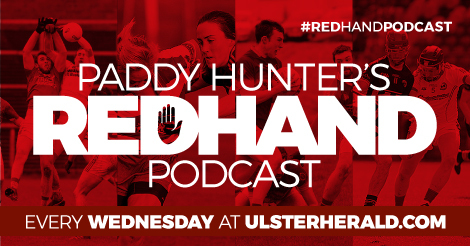 Also some exciting news about Red Hand Podcast…. We look back at the opening weekend of the Tyrone All County League with reaction from Omagh, Pomeroy and Greencastle camps while the Tyrone hurlers face Derry in the Ulster final on Easter Sunday.